If you like Halloween, I'm pretty sure you'll need to immediately download some wallpaper and get your computer looking festive. Pick from this big gallery at Smashing Magazine, or grab Eleanor Grosch's latest creations. You have read this article desktops / downloads / halloween / printable with the title October 2008. 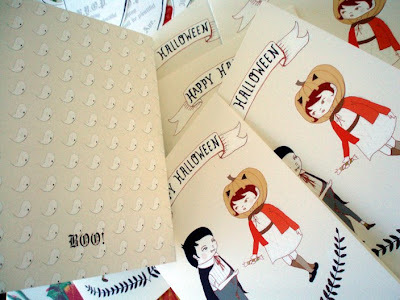 You can bookmark this page URL http://jenkrebs.blogspot.com/2008/10/happy-halloween.html. Thanks! 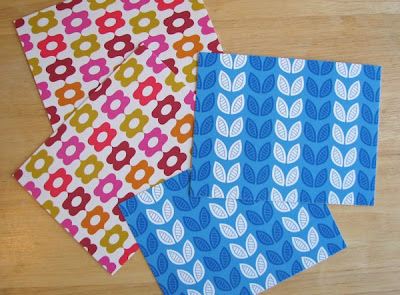 I've put some patterned goodies into my newly revived Etsy shop online. Including some lovely totes made by Grandma G (my mom), whom some of you know from the comments on this blog. I have multiples of most things, so I'll add as we go along. You have read this article design work with the title October 2008. You can bookmark this page URL http://jenkrebs.blogspot.com/2008/10/my-etsy-shop-is-now-restocked.html. Thanks! Departing from the topic of fabric now. Because the election is right around the corner! Print your own posters for the candidates. Choose from about a billion amazing Obama posters here. I searched and searched to find McCain posters, but this is the only one I came up with. If you'd like to see both gentlemen together, take a look at these movie poster spoofs. Or if you'd like to download a cool poster urging everyone you know to vote, go here and click a thumbnail, then click the larger image that appears. You have read this article downloads / printable with the title October 2008. You can bookmark this page URL http://jenkrebs.blogspot.com/2008/10/printable-campaign-posters.html. Thanks! If you couldn't make it to Quilt Market but need a quilty fix, download some desktop wallpaper made with Anna Maria Horner's fabrics. 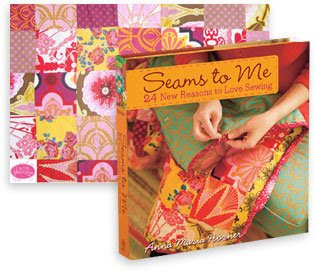 She has a new book coming out, Seams to Me: 24 New Reasons to Love Sewing. If you want to win a free copy, a sewing machine, some fabric, and other goodies, click here to register. You can enter once a day until Nov. 14 when the sweepstakes closes. You have read this article desktops / downloads with the title October 2008. You can bookmark this page URL http://jenkrebs.blogspot.com/2008/10/quilt-your-computer.html. Thanks! I'm back from the fall 2008 International Quilt Market in Houston. 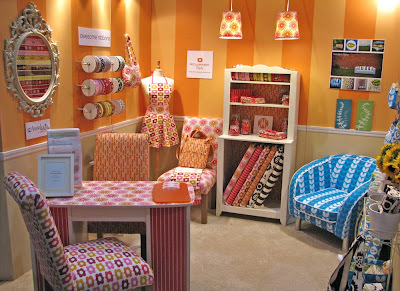 This is the JCaroline booth where my non-quilting fabric was on display. (Click photo to view larger.) 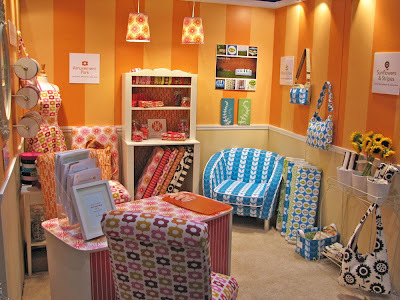 I found out last night that our little orange room won the award for Best New Exhibitor! I arrived in Houston on Thursday night and got a tour of Caroline's immaculate warehouse, followed by an awesome dinner prepared by her husband. I got to chat with Olivia a little bit, too, who is quite friendly and also enjoys hammers and drinking syrup straight from the bottle. Friday was set-up day at the convention center, followed by the Fabric 2.0 party hosted by JCaroline, Michael Miller, Moda, and Etsy. Saturday was the first day of the show. Here's a photo to give you an idea. This is probably one quarter of the whole thing. Although I was hoping to ride on a scooter, I did not get the chance. I loved getting to meet people in person that I've only known through emails and blogs. I was going to list a bunch of them here, but then was afraid I'd forget someone and hurt their feelings. Hey, ladies and gentlemen, you know who you are. It was a pleasure. And if at any point I sounded like a moron when speaking to you, it was probably because I'm an introvert and the circuits in my brain were completely fried by all the activity. I got home yesterday and told Alex, "I'll eat some dessert with you as soon as I unpack my pictures. Pictures? No, I mean, condiments. No. I mean, toiletries." No joke. And I'd better recover today, because tomorrow I'm going to another trade show for my other career in which I am a graphic designer. Graph Expo, a colossal printing trade show here in Chicago. Bye for now. You have read this article random with the title October 2008. 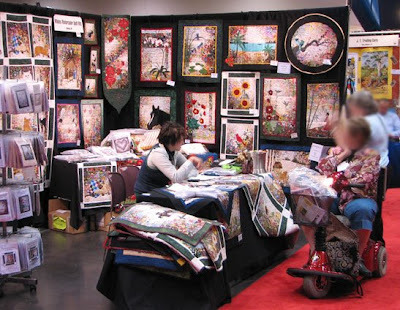 You can bookmark this page URL http://jenkrebs.blogspot.com/2008/10/back-from-quilt-market.html. Thanks! 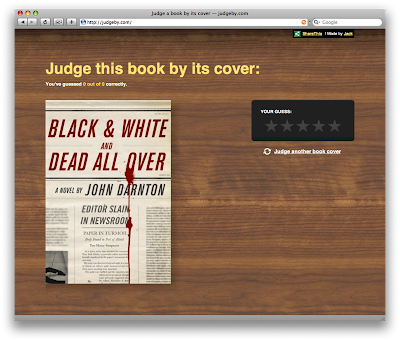 In this quiz, look at a book cover design and see if you can guess the book's rating on Amazon. (Via SwissMiss.) And if you're enthralled by book covers, check out the Book Design Review blog. You have read this article graphic design / time-wasters with the title October 2008. You can bookmark this page URL http://jenkrebs.blogspot.com/2008/10/do-judge-book-by-its-cover.html. Thanks! 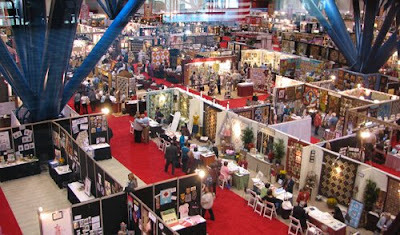 Today I'm off to Houston for the Quilt Market trade show, but you'll never know I'm gone since I've got a blog post already scheduled for tomorrow. I'll tell you all about the show next week. 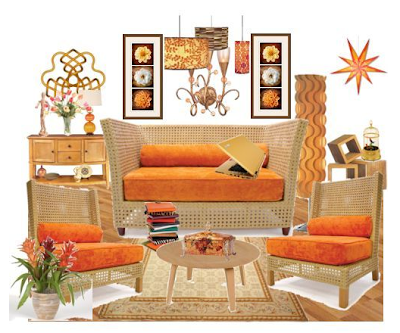 You have read this article decorating with the title October 2008. You can bookmark this page URL http://jenkrebs.blogspot.com/2008/10/orange-kleenex-box-box.html. Thanks! You have read this article design work with the title October 2008. You can bookmark this page URL http://jenkrebs.blogspot.com/2008/10/new-etsy-items-coming-soon.html. Thanks! You have read this article resources with the title October 2008. You can bookmark this page URL http://jenkrebs.blogspot.com/2008/10/make-collages-online.html. Thanks! You have read this article downloads with the title October 2008. You can bookmark this page URL http://jenkrebs.blogspot.com/2008/10/2009-printable-calendar.html. Thanks! 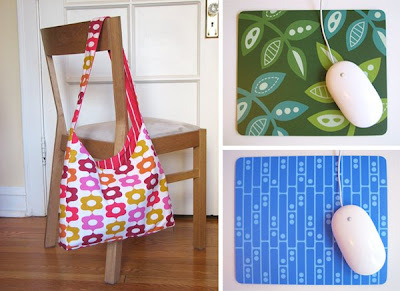 I set up a couple new Flickr groups so you can show off your projects made from my new fabrics. I will try hard not to be jealous of your mad sewing skillz. 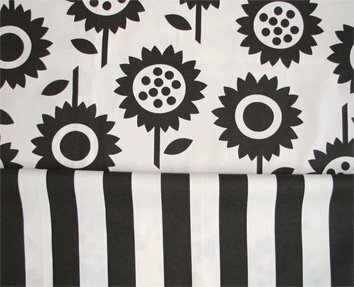 Add your own photos to the Amusement Park group and the Sunflowers and Stripes group when you create something fabulous. You have read this article with the title October 2008. You can bookmark this page URL http://jenkrebs.blogspot.com/2008/10/new-flickr-groups.html. Thanks! 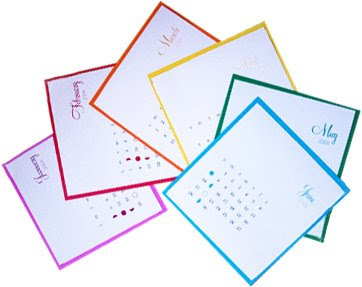 Download free, printable Four Seasons gift tags by Rachel Weber at Fog and Thistle. These would be fun on a package wrapped in brown kraft paper, I think. You have read this article downloads / printable with the title October 2008. You can bookmark this page URL http://jenkrebs.blogspot.com/2008/10/printable-gift-tags.html. Thanks! You have read this article tutorials with the title October 2008. 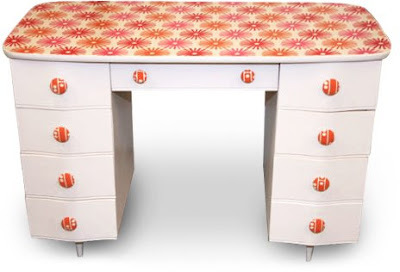 You can bookmark this page URL http://jenkrebs.blogspot.com/2008/10/goodwill-desk-transformed.html. Thanks! You have read this article design work with the title October 2008. 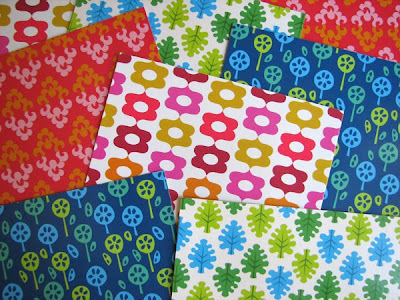 You can bookmark this page URL http://jenkrebs.blogspot.com/2008/10/going-to-quilt-market.html. Thanks! 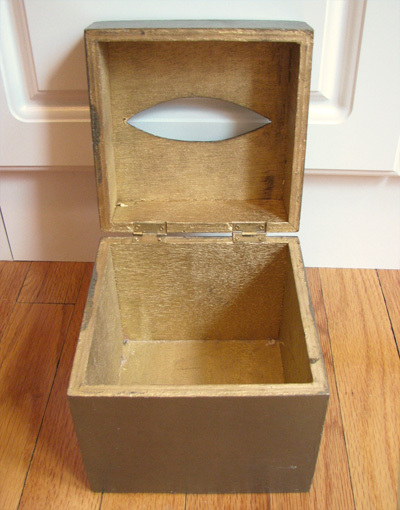 Compliments of 16 Sparrows, get this printable envelope in which you can store or mail your top secret spy documents. And speaking of top secret spies, go play some games on the new James Bond movie website if you like to blow stuff up. You have read this article downloads / printable / time-wasters with the title October 2008. 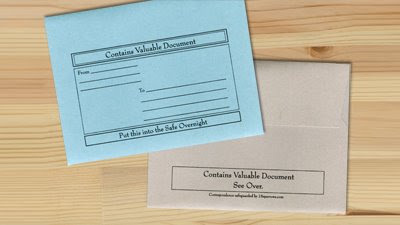 You can bookmark this page URL http://jenkrebs.blogspot.com/2008/10/download-valuable-document-envelope.html. Thanks! I'm not a huge frosting fan, but I do love powdered sugar, cocoa, and graphic shapes. 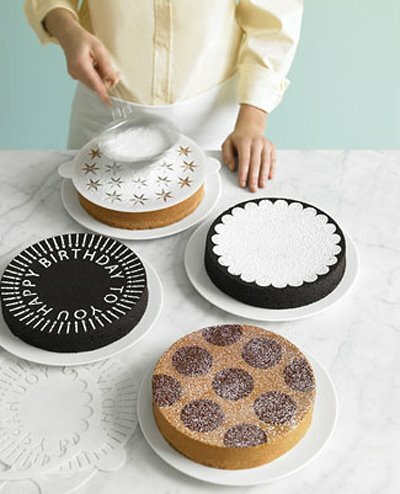 I think I need to make some cake stencils like these from Martha. 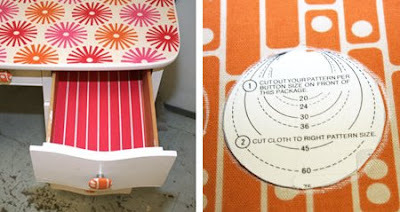 Get instructions for making your own with downloadable templates right here. More downloads are here. I like this homemade cupcake stencil, too. You could also download a font that would work well, like this one. You have read this article entertaining / printable / recipes with the title October 2008. You can bookmark this page URL http://jenkrebs.blogspot.com/2008/10/decorate-cakes-with-stencils.html. Thanks! 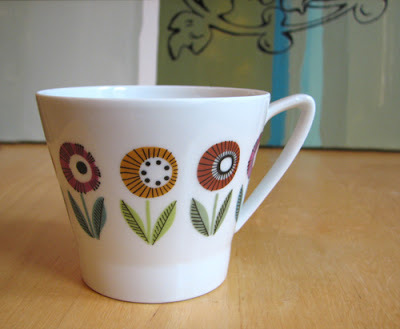 New arrival at my house: this Upsala Ekeby cup, made in Sweden in the '50s. A week or so after I made these, I saw it on etsy and fell in love! Honestly I don't set out to make retro-looking designs; when I draw stuff out of my head it just comes out that way. I should probably stop that, but it's hard when it's subconscious. You have read this article favorite things with the title October 2008. 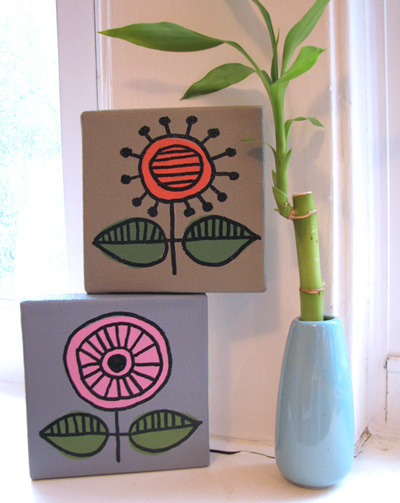 You can bookmark this page URL http://jenkrebs.blogspot.com/2008/10/etsy-purchase.html. Thanks! 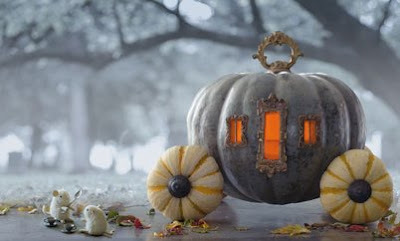 You have read this article decorating / halloween / tutorials with the title October 2008. 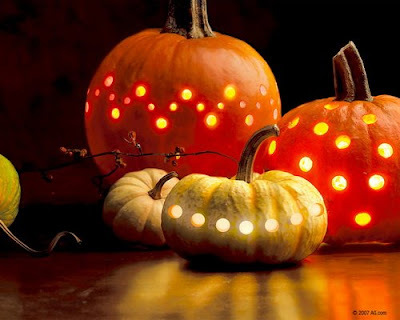 You can bookmark this page URL http://jenkrebs.blogspot.com/2008/10/pumpkin-decorating-ideas.html. Thanks! 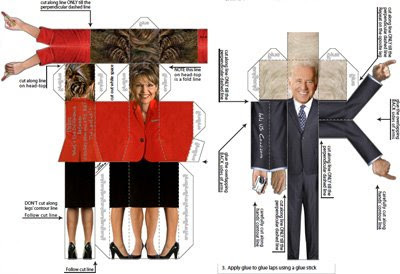 Sarah Palin and Joe Biden have been added to the models you can download and make at foldUScandidate.com. Just don't let your boss catch you busily folding these in your cube this afternoon. You have read this article downloads / paper / printable with the title October 2008. You can bookmark this page URL http://jenkrebs.blogspot.com/2008/10/make-your-own-vp.html. Thanks! You have read this article design work with the title October 2008. 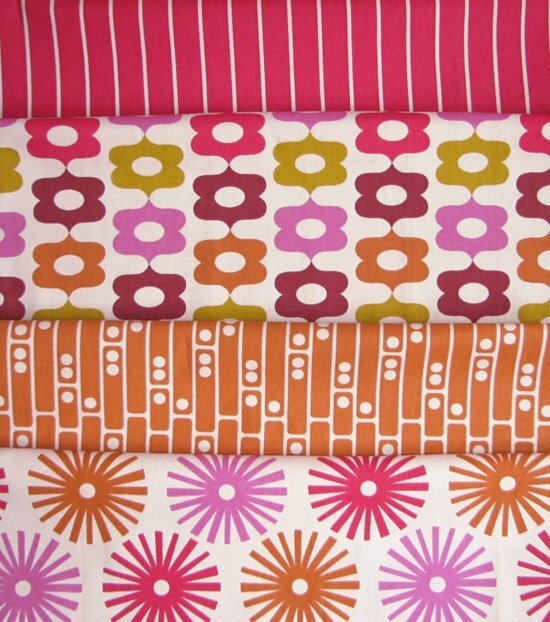 You can bookmark this page URL http://jenkrebs.blogspot.com/2008/10/my-new-fabric-is-now-available.html. Thanks! You have read this article paintings with the title October 2008. You can bookmark this page URL http://jenkrebs.blogspot.com/2008/10/paint-pen.html. Thanks!